TUNISIA REVEALED! Multiple Dates Offered! ONLY $2,895! NO SINGLE SUPPLEMENT! This special value tour of Tunisia explores many regions of the country, from the archaeologically rich northwest, to the semi-arid and oasis regions of southern Tunisia and the island of Jerba. “Tunisia Revealed” provides a wonderful opportunity to enjoy and appreciate Tunisia at a modest price! Wassim is a professor of English and U.S. politics and culture at Sousse University in Tunisia. He has also served as a professor in Saudi Arabia and as an assistant professor of American History and American Politics at Villanova University in Philadelphia, USA as part of a 2013-2014 Fulbright Exchange. In addition to being a prolific author whose writings have been in many prestigious journals, Wassim has been an honored Fellow at the Multinational Institute of American Studies, at New York University and an invited researcher in Minneapolis, Minnesota. He holds graduate degrees from both the University of Paris and the University of Grenoble in France. 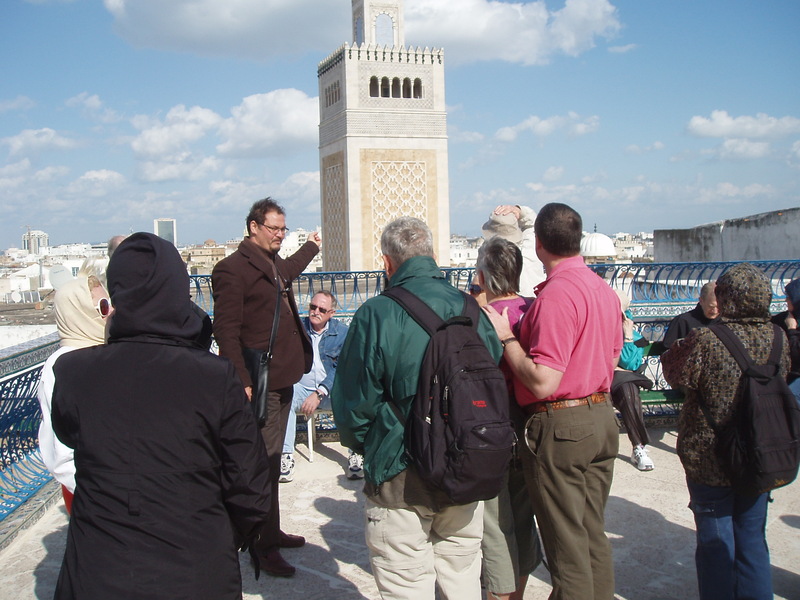 Wassim has led many tours over the years for Iconic Journeys Worldwide and brings together his knowledge and winning personality to make the tour a special Tunisia travel experience. “Wassim, I am finally back home and have been thinking a lot about my time in Tunisia. A large part of my appreciation for your country and cultures come from your expertise and insights. You gave us a wonderful introduction to an area I knew little about. Since I have returned home I have been able to describe to friends what a fascinating country Tunisia is. So thank you for all your hard work and infinite patience.” ~ Sherry, Ca., USA. Aicha Boukhari has been leading clients of Iconic Journeys Worldwide for many years. Fluent in English, French, German and her native Arabic, there is nothing that Aicha shies away from. Her knowledge of history and Tunisia‘s wealth of historic sites is endless and as a working mother, she can shed light on women’s and family issues. Above all, Aicha is personable and a consummate professional. Lecture at the Bardo Museum including Roman Jewish mosaics. Viewing the mosaics at The Bardo Museum, Tunis, Tunisia. This morning, you start your day with a visit to the Bardo Museum, a former Ottoman palace housing one of the finest collections of Roman and Carthaginian mosaics in the world. This will help set the stage in learning about Tunisia‘s history during Roman times. From the Bardo, you drive to the suburbs of Tunis where you will visit Carthage, the most famous (though by no means the largest) of the ancient sites in Tunisia. This morning you depart Tunis for the northwest part of the country, taking scenic, rural roads, with your first main destination being Bulla Regia. This well-preserved site has numerous examples of underground architecture, as well as well-preserved mosaics, in situ. This morning you tour Kairouan. Kairouan is a rather provincial town. However, the city was founded and subsequently developed during early Islamic times, with Kairouan’s Great Mosque, dating from the 7th century, reputed to be the oldest mosque in Africa. Kairouan’s location along the caravan routes also provided a base for a flourishing crafts industry. Detailed architecture in the old town of Tozeur. Stroll along the oasis of Tozeur, Tunisia. This morning depart Tozeur going east via the Chott-el-Jerid, Tunisia‘s salt lake and then a stop in Douz, a small town that appears to be plopped down amidst the dunes. Douz is often a jumping off point for desert treks going further south. In Douz, for those who wish, they can take an optional camel drive into the dunes. Inside the Ghriba synagogue. Jerba, Tunisia. 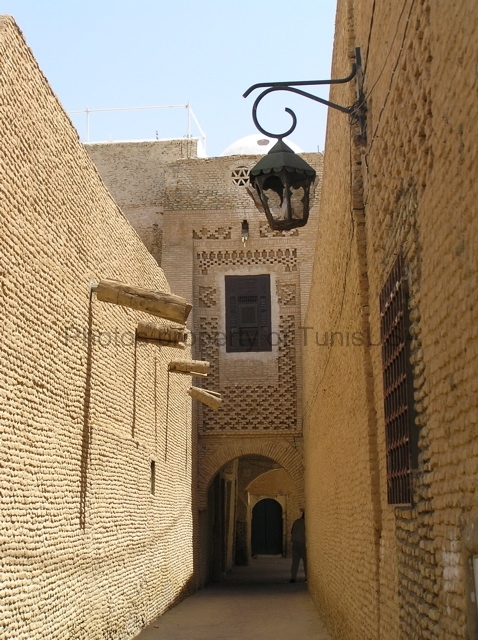 This morning you visit the historic section of Sousse; the ribat and the Sousse Museum. This morning you will be transferred to the airport in Tunis for your departure flight. Located in the seaside area of Gammarth, less than ten minutes from Carthage, Sidi Bou Said and La Marsa, some 20 minutes from the heart of the city, the Golden Tulip is a deluxe hotel with beautiful interiors, spacious rooms, several restaurants, very nice spa and fitness club and architecturally, very attractive. Not on the ocean, but near the ocean and many nice suburban dining areas, on a hill overlooking the sea, five minutes from the ocean. The hotel also has an excellent fitness center on site, as well as two outdoor swimming pools. Service is nice, but not worthy of being classified as 5* service. Owned by the same French company that owns the Sangho Hotel in Tatouine, the Ksar Rouge provides comfort in a well designed setting incorporating architectural styles indigenous to the oasis region. Very hospitable staff and setting. One of Tunisia’s best managed hotels, the Hasdrubal Thalassa is also a nice change of pace from Jerba’s many very large hotels. The Hasdrubal Thalassa is architecturally very attractive, with very nice landscaping. Nice rooms and a very nice restaurant. Highly recommended for stays in Jerba. Beautiful interiors both in the common areas and within the spacious guest rooms, utilizing Tunisian tile work and native handicrafts. Located within the heart of Kairouan with architecture that borrows one of the historic walls of the city. For dinner, there is a buffet restaurants, an “al la carte” restaurant, as well as a very nice coffee house. The service standards and the infrastructure are not that of a 5* hotel. Le Kasbah is the only hotel in Kairouan even approaching the standard of a nice hotel. However, our honest appraisal, constantly updated by client feedback is that the advertised “wi-fi” rarely works and is located in the lobby, clients have commented about the lack of place for shower hose, etc. This having been said, it is the best of Kairouan. Alcohol, additional beverages and any items of a personal nature. NOTE: Hotel star ratings reflect Tunisia Ministry of Tourism ratings and may not be commensurate with international ratings.